Namibia’s untouched north is getting more and more popular amongst travellers. I can certainly relate as I also enjoy coming here. Especially the north-east, the Kaokoveld, appeals to me. Starting around Sesfontein, where desert elephants roam the Hoanib valley and travelling further north into the land of the Himba, you will find a village by the name Epupa, nestled at the Kunene River bordering Angola. Epupa itself is rather small, but it’s growing with every campsite, lodge and sparsely stocked corner shop. You will also find a school and a health clinic here. Himbas who disengage from traditional village culture live in Epupa, looking for a livelihood in regional tourism. Travellers can go rafting, hiking, birding and visit Himba villages. 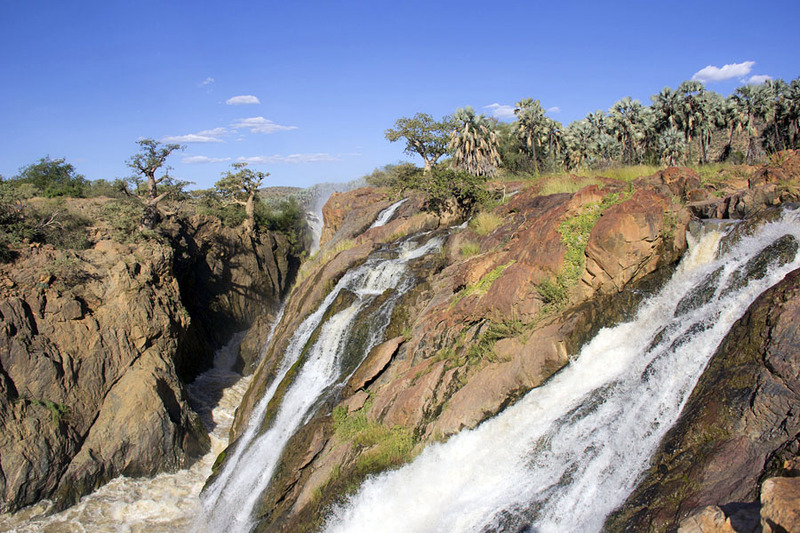 But there’s one activity that’s certainly one of a kind: the Epupa Falls. Translating loosely from the Herero language, Epupa means “falling water” and “foam”, referring to the white foam created by the thundering water. And this pretty much describes exactly what you will see: roaring masses of water creating a strong spray. The Epupa Falls fall about 37 metres deep. Compared to other waterfalls in the region, such as the Victoria Falls, this may not sound like a lot. But here, you will see a series of waterfalls, covering a whole of 1.5 kilometres, thundering across the cliffs. 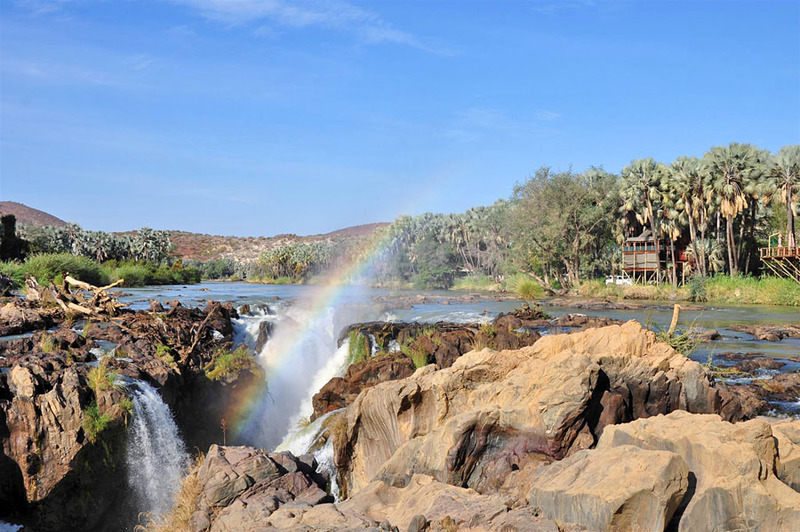 Despite changing seasons and subsequent changing amounts of rain water feeding the falls, you will always be welcomed by an idyllic scenery at the Epupa Falls. The shores are lined with Makalani palms and Baobab trees, giving it a picturesque flair, while you listen to the wild thunder filling you with energy. Being here is simply beautiful; walking the path along the gorge, stopping at different viewpoints – you will be humbled by the sight of the water dashing into the deep. My favourite time at the falls is just before sunset. I will look for an elevated spot on the rocks lining the path. From here, I have a great view across the river course. It’s fascinating to observe the water calmly collecting in a pool of up to 500 metres width, before it changes gear and thunders down into the deep. The sun setting behind me must enjoy this sight as well, immersing it in its soft-shining light. The colours of the surroundings intensify and make you believe you have fallen into a dream like scenery: the river, the waterfall, naked cliffs, Makalani palms and Baobab trees, the blue and orange sky, romantic hues and next to me, other travellers who eagerly inhale this paradise-like atmosphere, just like me. What more can your heart wish for? You can witness this magical sunset yourself on our 14-day safari Namibia’s Untouched North.